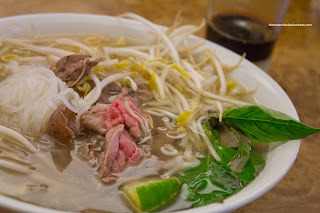 It almost seems like a ritual for us to go for Pho after Sunday morning hockey (I wrote this awhile ago!). I guess it is the best combination of inexpensive and somewhat healthy. 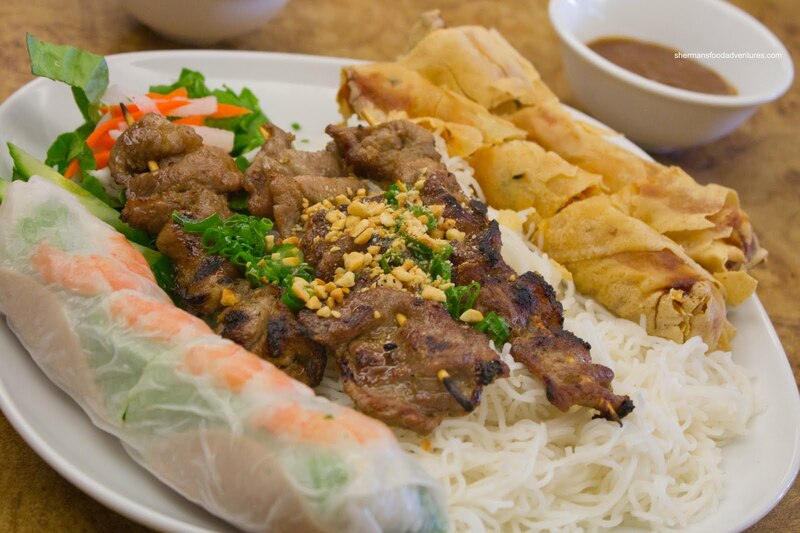 Not really with a destination in mind, we headed to Kingsway in search of Vietnamese food. Naturally, that would not be a difficult thing to do since there is a Vietnamese restaurant practically on every block. That is why we just randomly went to the corner of Kingsway and Victoria. Ah yes, the former location of Pho Bich Nga... We didn't end up going to the restaurant that replaced the offensively and humorously named former occupant. Instead, we found the brand spanking new location of Mui Ngo Gai. If this name rings a bell, it is indeed the same people who run the Nanaimo location. This new place occupies a formerly popular tenant as well - Double Double. 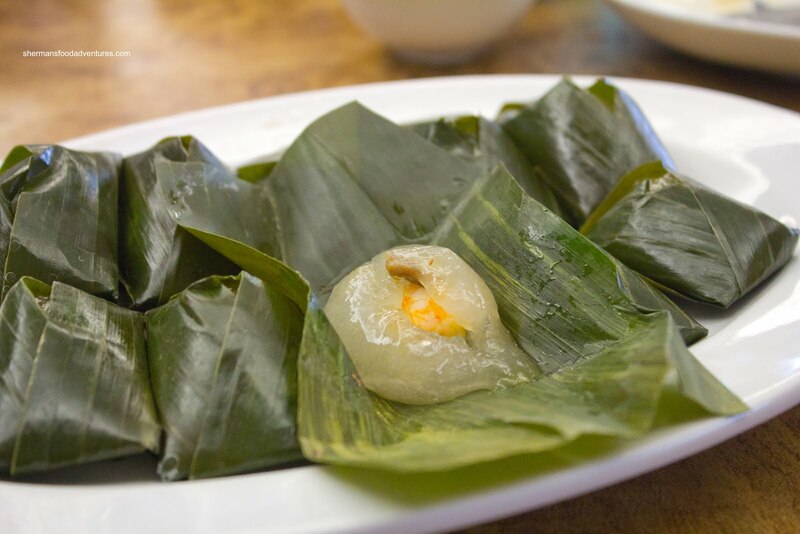 Mui Ngo Gai's claim to fame is their diverse menu which offers cuisine from both the North and South parts of Vietnam. Hence, you'll see a whole bunch of things that are not typical of a Pho joint. However, much like Chinese restaurants that try to cover too many different regional cuisines, things much get lost in translation. With all the choices on the menu, we pretty much stuck to the regular stuff partly because some of the more exotic dishes are not available until after 4:00pm. With that said, they were able to make the dinner entree I had ordered (more on that later). Milhouse predictably had a Combo Platter with vermicelli, BBQ pork, salad roll and spring roll. As you can see, this was a large plate of food with BBQ pork skewers that were slightly charred. Good flavour and very tender. 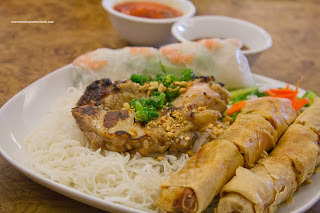 The salad roll was not bad being rolled tightly with a well-balanced dipping sauce. Despite its disfigured appearance, the spring rolls were crispy with a tasty non-gritty filling. 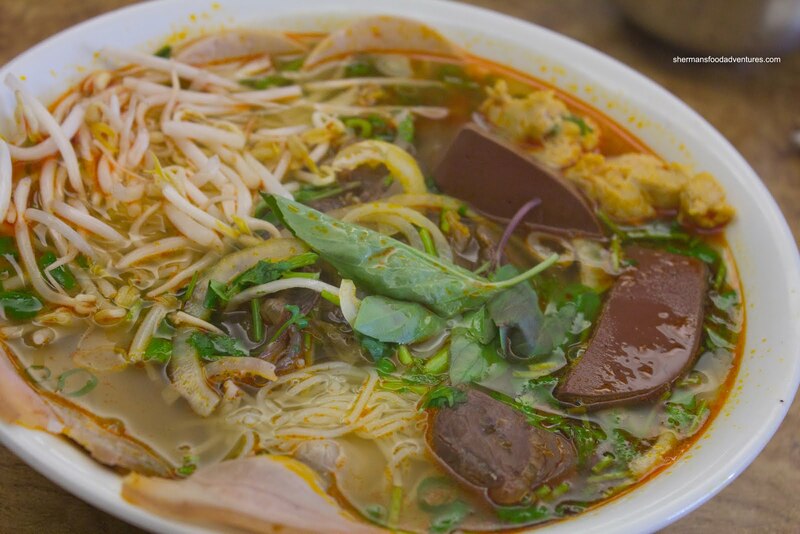 Kaiser Soze took my first choice which was the Bun Bo Hue. Turns out I didn't miss much because the broth was very mild with only slight hints of lemongrass and spice. Noodles were fine while there was no absence of tender meats and pork's blood. No pork knuckle though. Of all the things I could've ordered, I really wanted to try the Pho Dac Biet as a baseline of sorts. In the end, it was decent. The noodles were al dente and not clumpy while the meats were plentiful and tender. The soup base was on the weaker side though. It was mostly sweet with not a huge meat component. Now everyone gave me a hard time for ordering such a "typical" item. 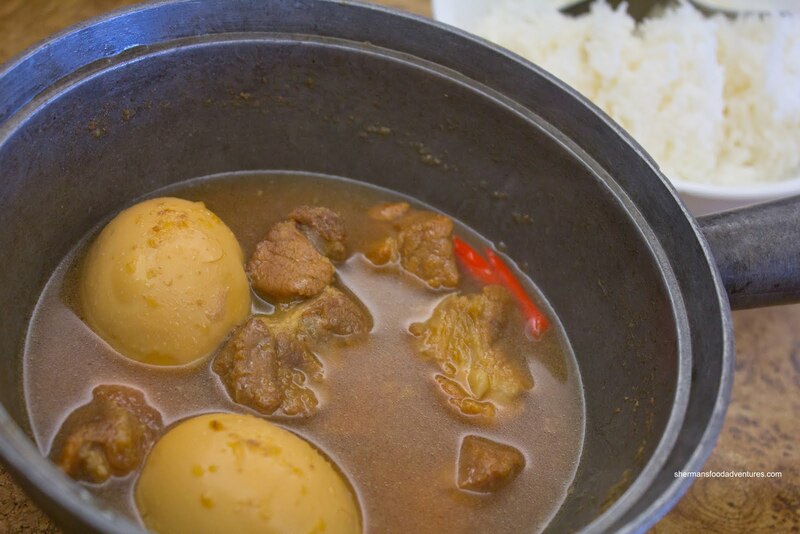 So in response, I decided to try a dinner specialty dish being the Thit Heo Kho Tau (Braised Pork & Egg in Coconut Juice). Yes, I ate 2 meals... The things I do for this blog! Wait, Mijune can do 3 meals, so this would only be 2nd course for her. As clearly evidenced in the picture, it is no wonder I could eat 2 meals since this one was super small. Yes, count'em, that's 2 eggs and 5 pieces of pork. Now it did come with a bowl of rice and similarly to a curry, there needn't be a huge portion anyways. For what was there, the pork was super tender and flavourful. Despite the use of coconut juice, I still found that flavour component a bit weak. Loved the eggs though - nice texture combined with a depth of flavour. As if this wasn't enough food for me, JuJu and I shared an order of the Banh Bot Loc wrapped in banana leaves. These are essentially glutinous tapioca, shrimp and pork dumplings. I found the texture to be slightly soft and the flavour to quite mild. I've had better, but these were okay. We had to share them since we were quite full at this point. Yet, that did not stop JuJu from having a combo plate of his own consisting of Lemongrass Chicken and Spring Rolls with vermicelli. The chicken was super moist and juicy with good flavour and charring. The spring roll were the same as Milhouse's order. In the end, we were pretty satisfied with our food and really appreciated the modern decor. Much nicer than their old location. The food is generally solid, if not unspectacular. We appreciate the diverse menu, but question some of the pricing. It really gets up there with the specialty dishes. - Trying to represent too many different regional cuisines?